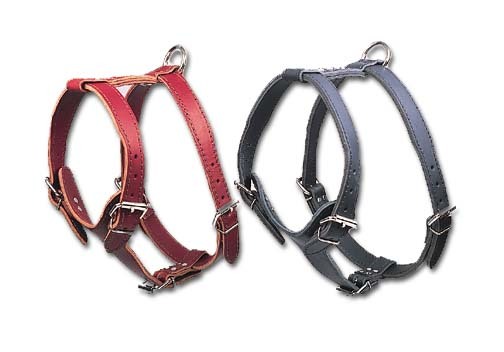 Heavy-duty 2-ply Latigo leather harness. Excellent hardware. 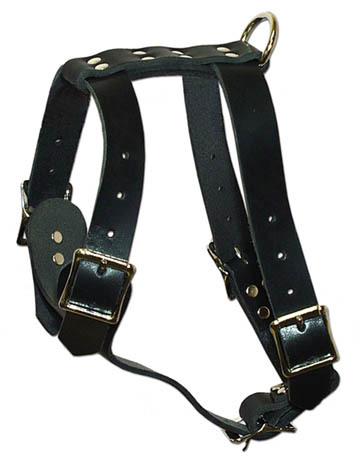 #176DS Medium: Chest Strap (A) Adjusts 28-34"
Neck Strap (B) Adjusts 19-25"
#176DS Large: Chest Strap (A) Adjusts 31-37"
Neck Strap (B) Adjusts 21-27"
#176DS X-Large: Chest Strap (A) Adjusts 38-45"
Neck Strap (B) Adjusts 22-28"
Quality 1-ply Latigo leather harness. Excellent hardware. Nickel-plated studs and 1/2" steel spikes. 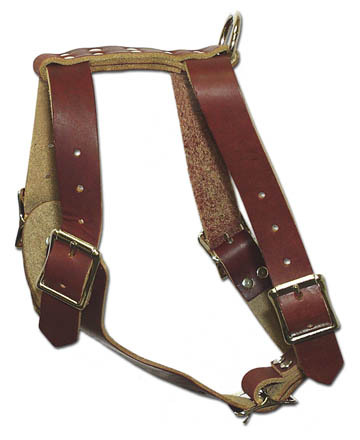 #177 Small: Chest Strap (A) Adjusts 18-24"
Neck Strap (B) Adjusts 13-20"